From Fail to Win! Learning from Bad Ideas: Buildings and Structures by Nicola Barber. A From Fail to Win! Learning from Bad Ideas Book. Review: Do you like to see buildings fail and fall over, tilt, or break? Or do you like to see buildings that are able to withstand the test of time? Both kinds are interesting to see or read about like the Leaning Tower of Pisa, which had shallow foundations and tilted over a time. This tourist attraction in northwest Italy is just one of the ideas you can learn about in From Fail to Win! Learning from Bad Ideas: Buildings and Structures by Nicola Barber. There are a lot of disasters that have happened with buildings like the Leaning Tower of Pisa. One of them is the Ronan Point Tower collapse. This building was a high-rise and collapsed when a person lit her stove and it exploded. The explosion knocked out the walls and the floors, causing them to crash into each other like dominoes. Once the building was demolished, they dismantled it floor-by-floor and discovered that the nuts in the building weren't screwed in all the way and the holes were filled with garbage, not mortar. 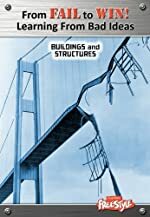 This book has many more fascinating incidents where structures have been built poorly. From Fail to Win! Learning from Bad Ideas: Buildings and Structures is an excellent book. I found it to captivate my interest, and boggle my mind with all the informative stories. I especially liked learning about the construction issues that led to the destruction of once impressive buildings. This would make an exceptional book not only for personal reading, but also for schools and libraries. The high-interest topic will excite even the most reluctant reader. We would like to thank Media Masters Publicity for providing a copy of From Fail to Win! Learning from Bad Ideas: Buildings and Structures for this review. Have you read From Fail to Win! Learning from Bad Ideas: Buildings and Structures? How would you rate it?